See scan - very good condition. 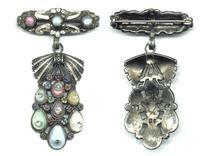 This is a nice and very good looking vintage and circa 1920ies Art Noveau lady broche jewel. Made out of white metal, enamel and glass stones in several colors. Back is marked 'L/N'. Nice jewelry antiques collector piece and one of the nice vinatge broches.